Beeswax candles are an easy roll-your-own treat that are so simple to make children can get into the act and have instant success! You'll need beeswax sheets from the craft stores or online, and a spool of wicking. You'll need a total of forty-four candles to light your menorah every night. Beeswax candles are more adaptable to different sorts of menorahs since they're easy to pinch and shape at the bottom, unlike the boxed Chanukah candles that are sold everywhere. 1. Using an X-Acto knife and straight-edge ruler, cut wax sheets into 2 x 4-inch rectangles. 2. Cut wick into 5 1/2-inch lengths. 3. Warm wax with a hairdryer, until just a little soft. 4. Place the wick about 1/2 inch from one edge of the wax. Roll gently but firmly, sealing the final edge smooth. 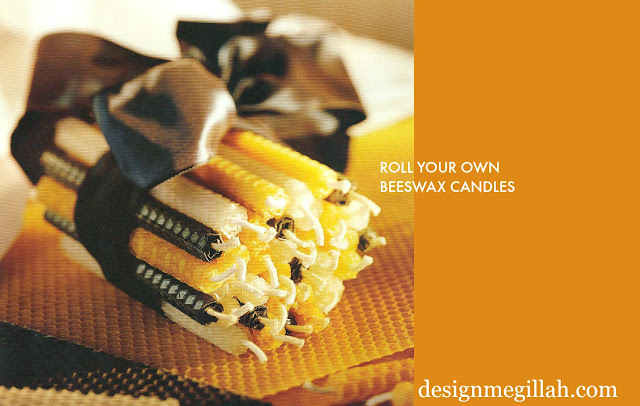 Beeswax candles in the stores can be pricey but yours will cost a fraction of the price!